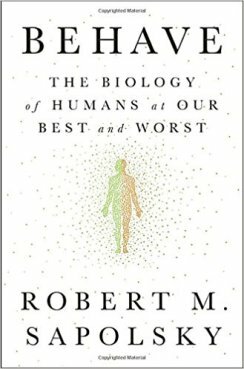 For anyone who wants to understand all of the huge number of factors that influence human behavior, as well as counter overly pat, simple, or downright mythological explanations for it, I cannot recommend a book more highly than this one. Every page – and there are almost 700 of them - is just packed with enlightening information on the role of almost everything you can think of. These factors include genes, gene regulation, epigenetics, neurotransmitters, hormones, brain structures, neural networks, unconscious cuing and sensory triggers, stress responses and protective factors, neural plasticity, peers and social acceptance, attachment figures, brain development in childhood and adolescence, socioeconomic and hierarchical status, collectivist vs. individualistic cultures, gender, reactions to “them” vs. “us,” heritibility vs. inheritance of traits, gene/environmental interactions, population density, evolution (individual, kin, and group selection), reciprocal and pathological altruism, obedience vs. resistance, cooperation vs. competition, and empathy. And a whole lot more. Can one book really be that encyclopedic?? Yes! I have no idea how he accomplished writing this. If you do not understand some of the scientific concepts that are under discussion, he conveniently includes three appendices in the book to help explain them. Not that the main body of the book is dry and overly technical. It is laced throughout with witty jokes, stories, and ironic observations that kept me thoroughly entertained. Does he leave anything out? Well, yes, he does not seem to know about the effects of rapid cultural change on families which may create shared intrapsychic conflicts leading to parents giving mixed messages to their children which then trigger and reinforce their repetitive self destructive behavior. But I haven’t yet seen anyone else write about that besides me – at least not in the way I have conceptualized the process - so I wouldn’t expect that. He also doesn’t discuss the effects of chaos theory on the amazingly multi-factorial “causes” of behavior he goes into - a minor quibble. Sapolsky shoots down behavioral and neuroscientific myths believed by health care professionals, some scientists, and the lay public alike (what mirror neurons actually do, for example) with the abandon of someone armed with an Uzi facing off against people armed with swords. Amazing. 1. Brains and cultures co-evolve. 2. We haven’t evolved to be selfish or altruistic, but to behave in particular ways in particular settings. Context is everything. 3. Genes are not about inevitabilities, but about potentials and vulnerabilities, and they do not determine any behavior on their own. 4. Evolution has been most consequential when altering regulation of genes, not the genes themselves. 5. Saying a biological system works well is not a value judgment – it can function equally well for those who do something wonderful or in those who do something horrific. 6. Nothing seems to cause anything - everything just modulates something else within a specific environmental context. And changing one thing often changes ten other things as a byproduct. 7. Any causative factor within any specified population of individuals within any specific environmental context has an average effect on behavior that may or may not apply to any given individual. There are always exceptions. In Amy Dickinson’s advice columns of 5/29, 6/14 and 6/18/17, and in Carolyn Hax’s column of 6/23/17, the Agony aunts published letters which serve as a good, simple and straightforward illustrations of something that family therapists have called the game without end, described in several previous posts. Whenever one member of a couple or a family makes a good case for changing the rules by which people in the family operate, other members of the family (or the other member of the couple) get suspicious. The person making the request has always followed the old rules. I mean, they say they want things to be different, but do they really? So the person making the request gets “tested” to see how sincere their request really is. The others make the requested changes, but do so in an obnoxious or annoying manner. My favorite illustration of this is a situation widely created by rapidly evolving changes in gender role functioning, which the letters that are the subject of the current post clearly illustrate. Both members of a couple work, but somehow everyone - including the females - has always expected the female to do all or most of the housework due to the rules followed by earlier generations of men and women. The woman often has treated the kitchen, for example, as her own personal fiefdom in which she is the undisputed boss of how things are supposed to be done. If she suddenly asks her husband or boyfriend to help clean up and do his share of the cooking, he wonders if she really wants that - because of her prior attitude and the accompanying behavior, which had been readily and repeatedly observable up to this point. So, when it’s his turn to clean the kitchen, he does a half-baked job and puts the dishes and pots and pans in all new places, so that his partner cannot find them when it’s her turn to do, say the cooking. Or he does any of numerous other passive-aggressive things that annoy the heck out of her. So she criticizes him unmercifully for his poor performance. In a sense, she starts criticizing him for doing the very thing she had asked him to do in the first place. His conclusion: "See, she really didn’t want me to help out after all." I can never understand why he discounts his own behavior in drawing this conclusion, but that is highly typical. An effective way to handle a game without end so that the rules really can change is described here. 5/29/17. Dear Amy: I am really tired of my husband asking: “How can I help you?” “What can I do for you?” or “What do you need?”Here’s why this upsets me: If I am cooking dinner for the both of us and he asks, “What can I do for you?” I think, well, you are eating this dinner too, so why not just ask, “What can I do?” Why is he offering to do something “for me”? I get so frustrated that my response is: “…nothing.” When I suggest that he just pitch in, he tells me that I do these household things so much better than he does. He seems to want me to need him. I don’t need him. I just want him to initiate the household work on his own. He watches TV while I run around picking up the house or making dinner, and his only response is, “Am I in your way?”...When he finally does something like putting a load in the washer, he needs to announce it like it’s the second coming. What can I do? - — Frustrated!